As Bob Dylan once sang, The Leaves They Are a Changin’. OK, so that’s not right. Bob D. didn’t really sing that, but fall is in the air, and the leaves really are changing. Take advantage now, before the trees all shed their leaves for winter. Here are just a few ideas to enjoy fall’s splendor in and around the Washington, DC area. I’m sure nobody has forgotten about Skyline Drive, but remember to leave early. Traffic is sure to be jam-packed this weekend. For those of you who would rather avoid the schlep and the traffic, here are a few ideas closer to home. Take a walk, run or bike ride in Rock Creek Park. See the animals at the National Zoo and visit the bears and other animals before they hibernate for winter. 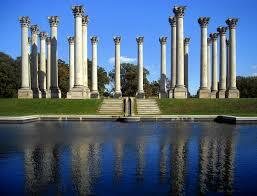 Check out the grounds and the National Capitol Columns at the National Arboretum (read these wonderful reviews from Trip Advisor – http://bit.ly/12ikfON). It’s surely one of Washington’s best kept secrets. If sports is more your style, fall is the time when basketball and hockey season begin. Both the Washington Capitals, and their star, Alex Ovechkin, and the Washington Wizards with John Wall, play at the Verizon Center in downtown, DC. While the NFL season is half over, there is still plenty of time to go see the Washington Redskins, or venture 40 miles to the north to go see the neighboring Baltimore Ravens. For those of you who prefer amateur sports, you won’t find a more awe-inspiring event than watching over 30,000 runners compete in the 39th running of the Marine Corps Marathon. This year’s event is this Sunday, October 26th. Be sure to take metro, as driving through the district and parts of Northern Virginia may prove very difficult this Sunday. When looking to entertain the kids, what better place than the Boo at the Zoo. Find details and tickets – http://nationalzoo.si.edu/ActivitiesAndEvents/Celebrations/Boo/. More kid-friendly ideas include pumpkin patches – http://dc.about.com/od/childrensactivities/a/pumpkinpatches.htm and corn mazes – http://dc.about.com/od/hoildaysseasonalevents/a/CornMazes.htm. As November turns a bit colder, you might search for the indoors and great photography at DC Photo Week http://www.fotodc.org/ . This year’s event is being held November 8th-16th. Last but not least, no list of fall activities would be complete without mentioning Halloween. As always, there are a cornucopia of events. If you need a few ideas to help get you going, you can find them here – http://dc.about.com/od/fallfestivalsandevents/a/HalloweenAdults.htm. So get out and enjoy. Wishing you and yours a wonderful fall! > Football season has already begun. Check out the Washington Redskins schedule http://www.redskins.com/news-and-events/schedule.html and enjoy the games with some friends. They play division rivals Dallas Cowboys on Sunday, October 6th. It will be played in Dallas, but you can always watch it on your favorite big screen. > Taste of DC http://thetasteofdc.org/ Sample favorite DC restaurants and join 40,000 “friends” for food and fun over the Columbus Day weekend. These are just a few fun ideas to do in DC this fall. Whether you plan fall hikes in Great Falls, Roosevelt Island, C&O Canal, take long scenic drives along Shenandoah National Park, or enjoy one of the many sporting events or concerts, I wish you all a happy, safe and fun fall season!